The Daily Mail says that Chelsea are to sign Juventus and Argentina striker Gonzalo Higuain for £53m. 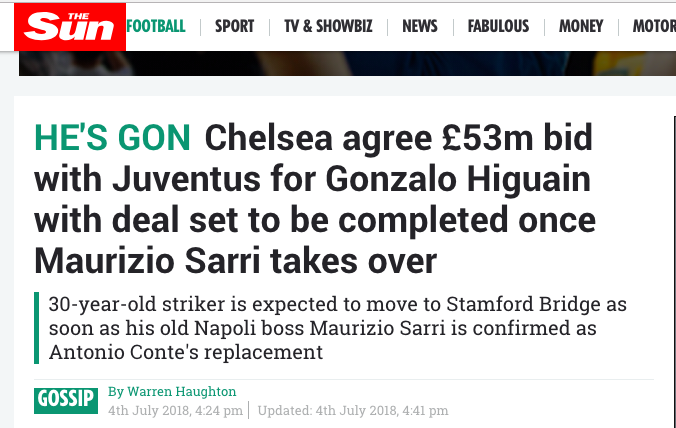 Just as soon as Chelsea tell Antonio Conte to vet thee hence, they will recruit Maurizio Sarri from Napoli as their new manager and get Higuain. Or not. Sky Sports hears Higuain’s agent say that nothing has been agreed and his man has not spoken to Chelsea. And the Times says Conte is not going quietly. The paper says someone on Chelsea’s technical staff emailed players not involved at the World Cup to tell them to report to the club’s training ground this weekend for fitness tests. Conte saw the missive and told everyone that the manager – him – doesn’t want to see any players until the following Monday. That was 2013. 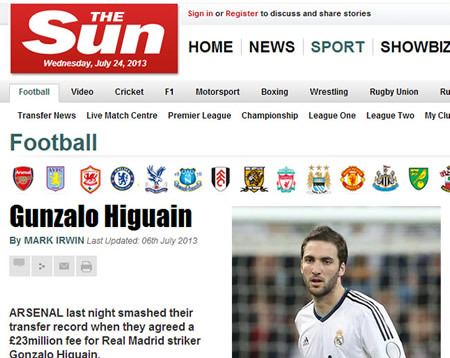 And the story is still on the Sun’s website, having been updated in 2016 – when Higuain still wasn’t playing for Arsenal. ARSENAL last night smashed their transfer record when they agreed a £23million fee for Real Madrid striker Gonzalo Higuain…. Now Wenger wants to build on Higuain’s imminent arrival by pressing ahead with negotiations for Wayne Rooney and Julio Cesar. 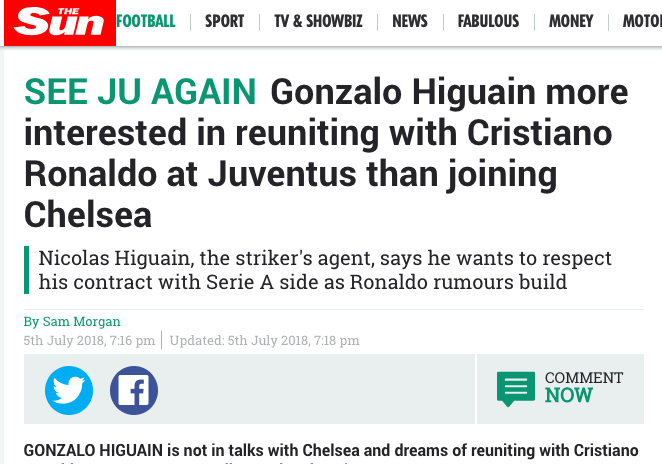 Higuain to Chelsea is a done deal. Fact.